Man, if only I could get my iPhone to last just a couple of hours more. There are cases for iPhone and other smartphones that will keep your devices lasting much longer than they usually do. But, if you’re like me you usually carry more than one device that could use a little more juice to get you through the day. For example in my bag I’ve got two phones, a kindle, an iPad, PS Vita, and Bluetooth headphones. All these things need power, and while some of them are less crucial to getting through the day, it would be nice to have everything powered. Enter the Zagg Sparq. I’ve been a huge fan of Zagg for a while. The only protection I keep on my iPhone and iPad is the Zagg Invisible Shield on front and back. I’ve always been really happy with them, so I was not hesitant to pick up another product from the company. The model I purchased is the 6000 mAh version. It is their top of the line battery pack claiming 4 iPhone charges before you’d have to recharge it. They also offer a 1220 mAh and 3100mAh version that will give you 1 and 2 charges respectively. I went for top of the line mainly because this is the only one that has two USB ports and has the ability to charge the iPad and iPhone at the same time. Which is a huge plus for someone who travels as much as I do. Now, lets talk about the design of the product. Don’t let the pictures online fool you, this thing is huge. I guess I should have known that coming in because it has a 6000 mAh battery inside of it, but I just didn’t expect it. Although it does fit well in the hand and is not extremely heavy, so if you’re throwing this inside a bag it won’t take up that much space. Once you get the thing plugged on you will notice the blue LED’s at the top to indicate how much power the device has. There is also an on-off switch located on the back so that you are not using its power when you don’t need to. Do not forget to turn this off, it will kill the battery over time. That was something I found annoying, but I guess it was my fault for not turning it off. Overall, pretty basic for design and the way it works. But, it’s a battery pack. It does not need to be flashy, it just needs to work. So how does it work? Well, unfortunately in my testing it does not charge my iPhone 5 four times before it dies itself. I got about three completely dead iPhone to 100% charges out of it, which in my opinion is not all that bad. When my iPad was completely dead I only got the iPad to about 75% before the Sparq died. Charging both from about 50% was enough to kill this thing rather quickly as well. It is clear using this with an iPad is not the best idea because of how large the iPad’s battery is. But, where I found this thing most useful was to simply “top off” your iPad or iPhone battery. If I saw that I was getting a little low on either device, I’d leave the Sparq in my bag with my iPhone or iPad and let them go for an hour, and I’d have 30 or 40 more percent more battery than I did an hour ago. It is especially awesome for the iPhone because this has the ability to charge the iPad that means that it will charge your iPhone much quicker than a standard iPhone charger. So, it does not get quite the battery life it claims on the website. However, in my opinion it still feels as though it lasts a lot longer than most other battery packs. All this for 99 dollars. Ouch, yes all this can be had for 99 dollars. At first I really had a hard time handing over 99 dollars for this product, but take a step back for a second. The other most popular battery pack, the Mophie Juice Pack Plus runs 119 dollars and only has a 2100 mAh battery. Plus with that you can only charge your iPhone with that device. 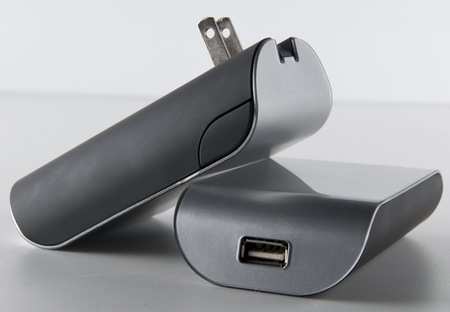 This has two USB ports on the other end so you can plug just about whatever device you want into this battery pack and get a little extra power out of it. I’ve been plugging in my kindle and my Bluetooth headphones to get these charged as well along side my iPhone. Not to mention, it has pass-through charging. So if you have the Sparq plugged into the wall you can plug in two devices and have them both charge as well. Obviously this will slow down the charging of the battery pack itself, but this can come in really handy for hotel rooms that have a limited number of plugs around. Once you get past the 99 dollars price tag if you are heavy traveler or even a light traveler I cannot recommend this more. I hated having a bulky case on my iPhone just to keep it alive another hour. With this, I can keep it in my bag and plug it in and get my iPhone back to 100% in no time. MyMac Podcast 466: Just how FABulous is Apple?